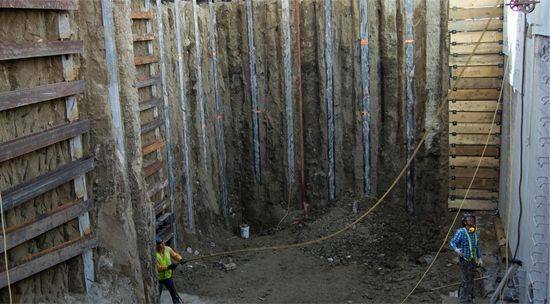 This project consisted of an interlocking secant pile wall, combined with horizontal underpinning to accommodate a new connection to a pump house at the Currie reservoir in Calgary. 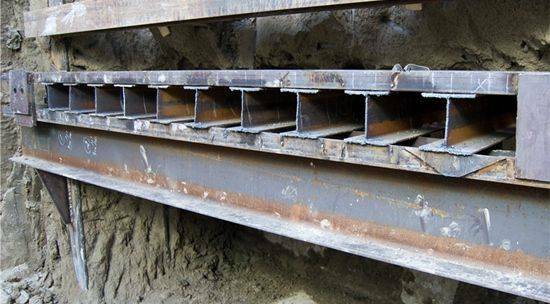 The interlocking secant pile wall (caisson wall) allows for an accelerated construction schedule as it eliminates the ground loss that is present with the use of other styles of shoring. Where utilities were present, bracing supports were used to resist the lateral pressures present behind the filler piles. Unique to this job was the installation of horizontal underpinning. The job required a new connection between the existing reservoir and pump house. To accomplish this task, a tunnel had to be created to accommodate the 900mm connecting water pipe. The underpinning provides support for the tunnel walls. The system worked well; after excavation, the resulting tunnel allowed safe access for the installation of the connection pipe to the pump house. Because of the job’s proximity to the working water reservoir, special environmental precautions had to be taken in order to avoid contamination. Site-specific procedures were implemented; in instances where lubricating oils had to be used, for example when sliding the horizontal underpinning beams, food grade oils were used over hydrocarbon-based oils. As a result, the integrity of the water supply was maintained throughout the duration of the project.